When foundation walls begin to buckle, bow or tilt inward, homeowners are correct to be alarmed. Outside pressure from soil and water can actually cause foundation walls to collapse! The PowerBrace™ is a patented foundation wall repair system that's designed to stabilize failing basement walls and provide the potential t straighten walls over time. These steel i-beams will stabilize the wall in its current position without any further adjustment. Over time, the PowerBrace™ System can be tightened to make bowing or tilting walls straighter. No matter what's happening with your foundation, we can help! Call us for a free basement wall repair quote today! We serve Clarksville, Nashville, Jackson, Murfreesboro, Owensboro, Philpot, Bowling Green, Fayetteville, Marion, Utica, Mcminnville, Franklin, Leitchfield, Shelbyville, Hartford, Antioch, Paducah and many nearby areas in Tennessee and Kentucky. Sub-par I-beam systems will rust and deteriorate over time. The PowerBrace™ system includes a zinc-coating that protects it from this kind of corrosion. When possible, we recommend repairing bowing or buckling foundation walls with Geo-Lock™ Wall Anchors. However, this wall anchor system requires access to the earth outside of the foundation. Sometimes, property line issues eliminate this as an option. When outside access is impossible, ask our foundation specialists to explain the advantages of the PowerBrace™ System. Our experts will be able to examine your foundation and determine of this repair strategy will work for you. The PowerBrace™ employs a unique, patented approach to stabilizing and straightening bowed and buckled foundation walls over time. The PowerBrace™ can be installed with no disruption to outside soils or landscaping. This foundation wall system installs quickly in your home, immediately and permanently halting the inward movement of your foundation walls. The PowerBrace™ is a wall repair system based on strong steel I-beams. The I-beams and their support hardware have a special rust-resistant zinc coating to ensure that your system will look and perform like new for decades to come. Our foundation experts will determine how many PowerBrace™ supports are required for your wall repair. Before a PowerBrace™ support is installed in your home, it must be cut to size. Next, the top of each brace is attached to a floor joist near the mudsill at the top of the wall. The specially designed bracket is bolted to the floor joist and contains a large-diameter bolt for adjusting and tightening after the installation. A PowerBrace™ installation will not damage your floor framing. To ensure proper performance of this wall repair system, your foundation contractor will inspect the strength of your floor joists prior to recommending this repair strategy. The PowerBrace™ Foundation Wall System works best when each I-beam is perfectly plumb or vertical. The contractor will use a level to fine-tune the position of each beam in preparation for the next step. At Frontier Basement Systems, we take pride in the lasting quality of each of our installations. We stand by each PowerBrace™ installation with our 25-year warranty against manufacturing defects, as well our installation warranty. To complete the installation of your PowerBrace™ System, each beam will be attached to your concrete foundation floor with a special, bolt-in-place bracket. Unlike other foundation wall repair methods that install from the inside of the foundation walls, the PowerBrace™ System spans the entire height of the foundation walls. This makes the PowerBrace™ system suitable for repairing walls that bow and buckle from the middle. Additionally, the PowerBrace™ can repair walls that are sliding inwards from the bottom or tilting inwards from the top. The PowerBrace™ System includes a unique, patented adjustment mechanism that is unlike any other I-beam foundation wall repair system. The bracket that anchors each I-beam to a floor joist includes a long bolt that can be tightened over time to advance the I-beam. This can force a bowed or buckled foundation wall back toward is original vertical & straight position. Straightening potential depends on several factors, including soil conditions outside the foundation. At Frontier Basement Systems we want to help you restore your bowing, buckling, tilting, or shifting foundation walls back to their original, structurally stable condition. To help you decide if we're the company for you, we offer free foundation wall repair quotes throughout our Tennessee and Kentucky service area. Each of our Free Estimates includes a no-obligation written price quote, an on-site consultation, and a copy of our 96-page full-color book "Foundation Repair Science". 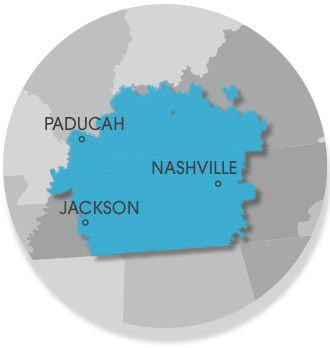 We proudly serve Nashville, Clarksville, Jackson, surrounding areas such as Murfreesboro, Owensboro, Philpot, Bowling Green, Fayetteville, Marion, Utica, and many other parts of TN and KY.